Ko'Olina Lagoon: You can how it's protected. 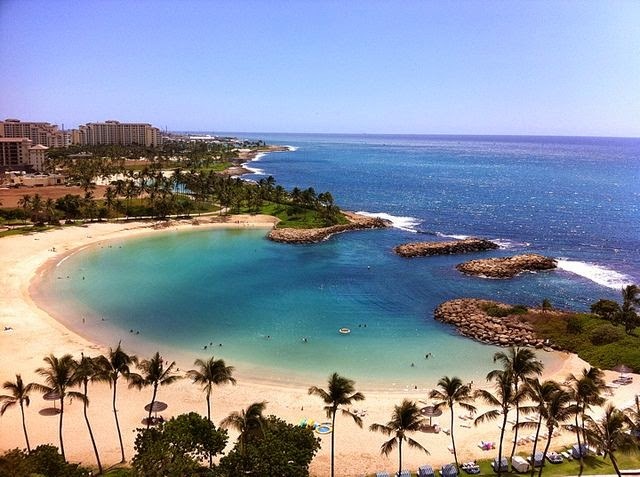 The Ko' Olina Lagoons is a a relatively "new" beach/resort on Oahu. The area has only seen major development in the last ten years or so. The lagoons are man-made and the developments around them (the Disney and JW Marriott Resorts) are bringing the area fame as a beautiful vacation spot. I've heard rumors that in the 15-20 years, the developers hope to make the area as big as Waikiki. That's alright with me. I'm not the biggest fan of Waikiki. Waikiki is expensive. I'll be the first to admit, snorkeling in the lagoons isn't near the best on Oahu. It doesn't even rate up there with some of the best spots. However, Ko 'Olina holds a special place in my heart because it's where I saw my first Hawaiian Green Sea Turtle or Honu. Calm waters. The lagoons are all protected by sea walls and tiny coves all offer protection from the open ocean. Clear water in most places. Some coral at Ko 'Olina but not much. Small variety of marine life. There are ways to get "free" parking at Ko 'Olina but to be safe you can get all-day beach parking for $10 near Lagoon #4. Drive up to the security gate, where you will need to check in (announce where you are headed on the Ko Olina Marriott grounds) before proceeding down to the beach. Follow Aliinui Dr to the left, and look for the posted signs for the different Ko Olina Lagoons. They will be numbered 1 thru 4.